Kelty Coyote 60 – front view and pass-through pockets. 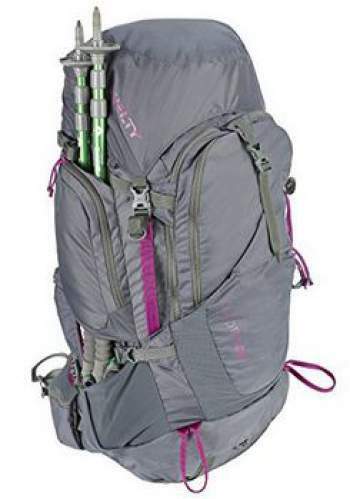 The Kelty Coyote 60 backpack for women has appeared on the market in the beginning of 2017 as a completely new pack in the existing great Kelty’s Coyote series. The Coyote series is well-known and it has been on the market for many years with Coyote 80 pack for men and Coyote 70 for women. 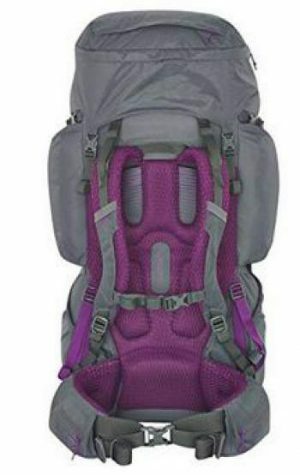 But now, Kelty has added two new packs to the series, the Coyote 60 for women presented in this text, and the Coyote 65 backpack for men described in my another text. So this impressive series is now richer for two packs. They all share the same features, the packs are very functional and reliable. The two new packs are smaller in size and no doubt very suitable for any multi-day hiking or backpacking tour, and for travel as well. This pack offers dual access to the main compartment. It comes with Kelty’s PerfectFit suspension system. You have a great organization and no less than 10 pockets. Top lid doubles as a day sling pack. As you realize from the pictures, the Coyote 65 looks like a classic top loading pack. So you have a removable lid, and a collar equipped with a cinch cord and a strap underneath the lid. However, you also have a very large U-shaped zippered opening on the front. The zipper is visible in the picture above. The pack also contains a separate bottom compartment. There is a divider between the two compartments and it can be removed so you can use the whole space as a single compartment with one extra bottom access. The lid can be removed in order to be used as a very handy sling pack. It has one padded strap so you can carry it on the back. The pack is hydration compatible, and the water hydration sleeve is inside the main compartment. There are hose ports on both sides of the pack. Coyote 60 backpack with its PerfectFit suspension system. Side view showing the side compression straps and side pockets. The suspension is based on a single aluminum stay and an HDPE back panel. So this seems to be the only difference from its bigger sister, the Coyote 70 pack for women presented elsewhere in this site. 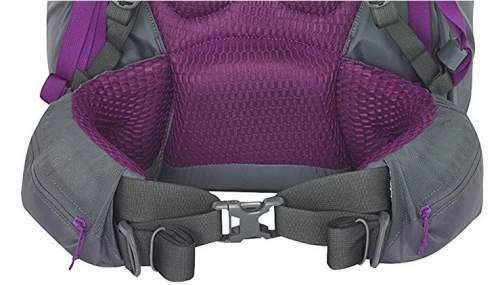 This is a women-specific design so the harness is narrower from the 65 liters version for men, and the hip belt is shaped to fit a female body. From the pictures, you realize that everything is incredibly well padded and covered with a very pleasant hex mesh. The harness in this whole series is adjustable, and this is yet another great feature. 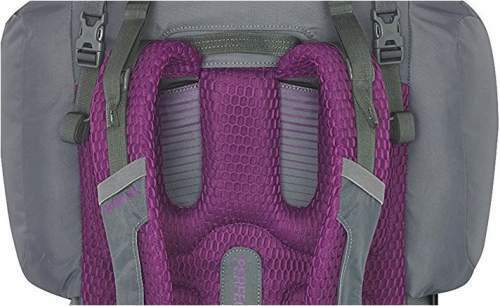 All packs have what they call the PerfectFit suspension, the Kelty’s unique design used in several of their latest series. 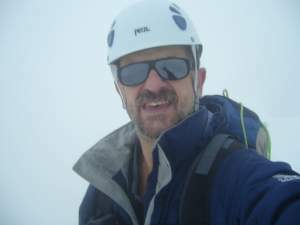 The meaning of this name is that you adjust the harness with the pack on your back, and with its full weight. There is no other brand on the market with such a clever design. The upper part of the harness showing the space within which the harness can be moved up and down. So, to adjust the torso length, you just have to pull the two straps on the sides, they are visible in pictures. In the picture above, you can also see the space designed on the back of the pack within which the harness can be moved up and down; this is around 10 cm of space, and the torso fit is in the range 14.5 – 18.5 inches (37 – 47 cm). The process of adjustment is shown in the video below (not on the actual Coyote 60 pack, but it is the same in several series of Kelty). In the image below you can see that the front straps on the hip belt are with four attachment points, so you have two straps from each side. I love this design, it is great because the belt is fastened in such a way that it hugs your hips. This is much better than a single strap which you have in many other packs. The HDPE reinforced hip belt with 4 attachment points for the front straps, and the massive lumbar padding behind. The pack is with handles on both sides and one extra carry handle is on the top of the harness. You have a full set of straps here. They include dual compression straps on both sides (visible in the pictures), dual straps on the bottom as well, and the usual sternum strap. Two attachment loops are on the bottom for ice axe and trekking poles. On the hip belt, stabilizer straps are on both sides. The Coyote 65 pack comes with 10 pockets in total, plus 2 pass-through pockets on the sides. You can see them in the pictures above. The usual dual zippered pockets are on the hip belt, two zippered pockets are on the lid, and dual stretch pockets are on the sides. But this pack has something extra – dual upper zippered side pockets. Behind these side zippered pockets, you have pass-through pockets shown in the first picture above. Here you can pass any long objects like trekking poles or tent poles, and store them in the stretch side pockets that are below on the sides. One large zippered pocket with internal organization features is on the front. In addition, there is one stretch shove-it mesh pocket on this front pocket. Very good and durable fabric. A bit on the heavy side. The rain cover is not included, pity. If it is important, you can order it here. The pack is not the lightest on the market, but you know, so many pockets with zippers, extra front access with the long zipper, such a great padding, and all straps and handless together add weight. So there is a reason behind the weight of this functional pack. Please add your own rating here. Weight: 4 lb 10 oz (2.1 kg). Volume: 3650 in3 (60 L). Dimensions: 32 x 16 x 13 in (81 x 41 x 33 cm). Torso fit range: 14.5 – 18.5 in (37 – 47 cm). – Body fabric: Poly 420D Small Back Stafford. – Reinforcement fabric: Poly 75x150D Tasser Coal. – Frame material: Aluminum + HDPE. Top access + front access. Bottom compartment with removable lid. Pass-through behind zippered side pockets. Large front pocket with organization. Hex Mesh on back panel, shoulder straps, and hip belt. The prices at the moment of writing the text for the three packs in the table are respectively $220, 170, 135. So the Kelty’s pack is moderate regarding the weight and excellent with respect to its price tag. To summarize this review of the Kelty Coyote 60 backpack for women, all features already existing in its bigger cousin, 70 liters pack are present in this smaller new pack. The size difference may be of importance for users, so it was a great idea to add this smaller pack to the series. These features have been tested in practice in the past years in the existing larger packs, and the rating for the packs from this series has been excellent. So if you decide to order this pack, you know well what you can expect. I have no serious objections to this pack, this is a great tool and I can fully recommend it. As mentioned above, there exists also the corresponding new Coyote 65 for men, added simultaneously to the series which now has four packs in total. Kelty has launched several new series in 2017, here to mention only Revol & Reva packs that are in the similar size range as the Coyote 60. 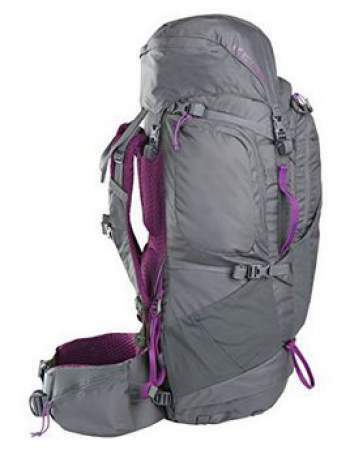 If you need a super lightweight pack please check this new Osprey Eja 58. Thank you for reading. I shall be happy to hear from you, so please use the comment box below. I wish you a pleasant day.